ElectraLink provides the Data Transfer Service (DTS) which is used by the electricity and gas industries to share data for key business processes. 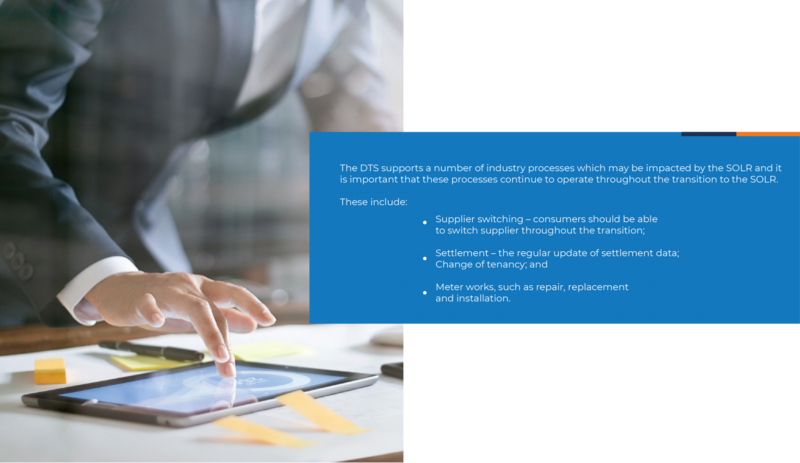 All energy suppliers use the DTS. When the Supplier of Last Resort (SOLR) process is initiated, ElectraLink has a number of services which it can provide to the exiting supplier, the administrator and the appointed SOLR to facilitate the smooth and efficient transition of consumers whilst protecting industry data. This document summarises these services. There are several activities that ElectraLink undertakes to ensure that these processes continue to run, that consumer data is always protected and that the transition of consumers to the SOLR works seamlessly. We offer a range of options to the SOLR, depending on their preferred method of transitioning the consumers. For example, a SOLR may decide to use the current data flows to initiate a Change of Supplier process for each consumer. This is typically done for small numbers of consumers, or where the SOLR does not want to use the Market Participant Identifier of the failed supplier. Alternatively, the SOLR could assume the Market Participant Identifier of the failed supplier. Finally, ElectraLink provides information to the appointed administrator, for example information about outstanding DTS charges. Need more information? Please take a look at our page Cloner Service.